The much-awaited all-USA total eclipse of the Sun on August 21, 2017 sent many residents of Boulder Creek to Oregon, Idaho and Wyoming to abide in the path of totality for two glorious minutes -- a nationwide personal pilgrimage to witness the temporary Death of the Sun. Those of us in the Bay Area who stayed behind hoped to observe through clear skies a fairly ample 75% eclipse. Eclipse was expected to start at 9 AM local time, reach maximum some time after 10, and return to normal around 11. 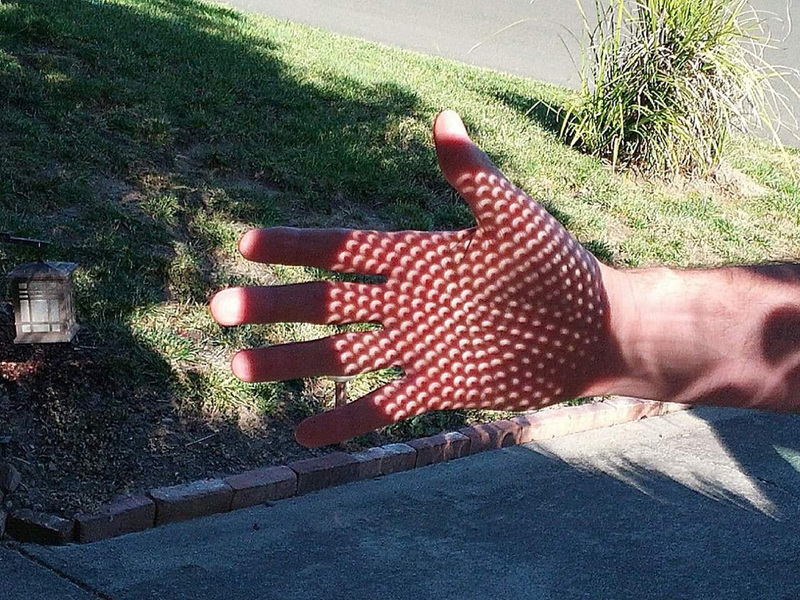 In the tradition of legions of legendary Moslem astronomers, I assumed the guise of Doctor Jabir and rigged up a simple solar projector in the parking lot of the Boulder Creek Post Office. When I got there, a guy named Gene from Bear Creek Road had already set up a powerful filtered telescope on Main Street in front of Liberty Bank. I recognized Gene and his telescope from previous eclipses and remembered viewing, through his instrument, images of the partially eclipsed Sun so large that you could count its sunspots. However, contrary to predictions of clear skies, the weather was extremely cloudy with morning fog filling the valley rim to rim as high as the summit. 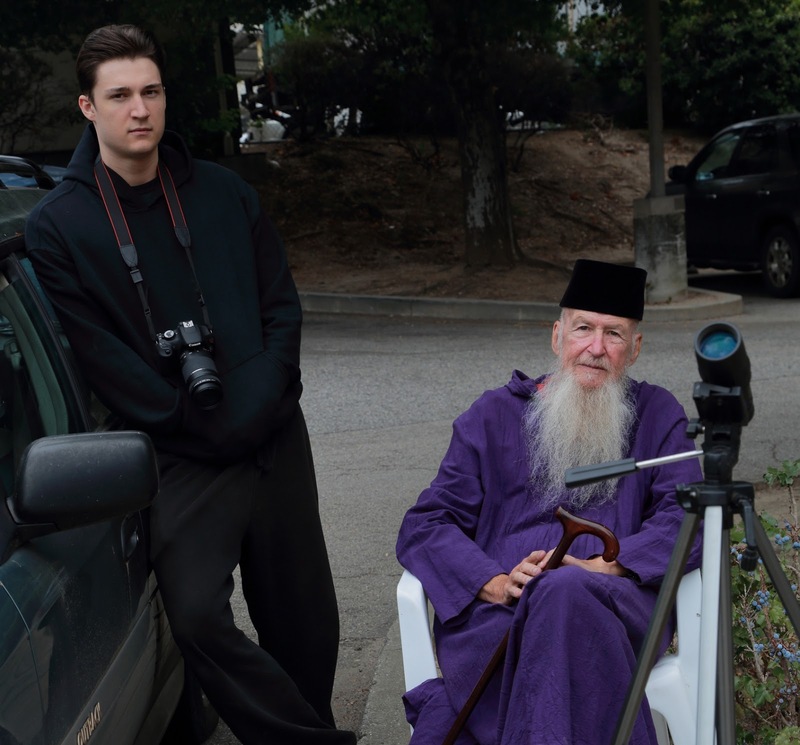 Despite the cloudy weather, about half a dozen stalwart spectators gathered in the parking lot to await the upcoming Death of the Sun. Sheila and Jerry Delaney, owners of one of Boulder Creek's longest-running businesses, Blind Pilot Jewelry, showed up with a box of Eclipse Cookies -- which consist of the common Oreo with upper black layer displaced to expose a crescent white filling. Jerry brought a welding helmet to filter the intense rays of the sun -- if it ever came out from behind the clouds. Reno DeCaro and his son Alex came to photograph the event for posterity. Long-time BC resident Judy Reynolds came by, followed by a woman in a wheel chair and her companion, whose names I did not get. All of us stood around in the fog (which was so thick it was almost drizzling), awaiting a lucky break in the clouds. And, then, yes, it happened! At a time close to totality, the clouds briefly thinned for a few minutes, long enough to view and photograph the eclipse without filters or instruments (the fog itself spontaneously provided us with a wholly natural solar filter). We snapped a few shots with our digital cameras before Nature quickly shut us down. The fog lasted till noon, after which the day quickly turned sunny and hot. Even as late as 10:30 AM, the valley was still filled with fog. 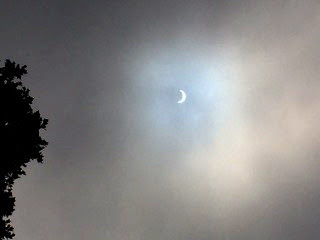 About 1000 feet above the Boulder Creek Post Office, Val Ahlgren at Ahlgren Vineyard snapped a picture with her iPhone of the cloud-filtered Sun near maximum extinction, similar to the lucky pictures we took in the parking lot. Many local viewers gathered at Crest Ranch on Empire Grade which was above the fog belt and were rewarded with a full-spectrum solar eclipse experience viewable only through dense sunglasses -- which were provided by local libraries and some hardware stores. 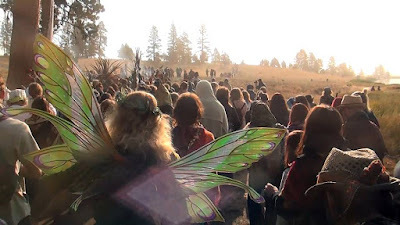 Meanwhile, some of our Boulder Creek friends, notably Allan and Sun Lundell (aka Doctor and Mrs. Future) traveled to the Symbiosis festival in central Oregon where they joined 70,000 other eclipse pilgrims to observe the Sun's temporary demise. Using a filtered iPhone, Dr and Mrs Future captured this beautiful "diamond-ring" photo of the total eclipse of the Sun from the Big Summit Prairie in Oregon. This year's total solar eclipse was billed as the "most photographed event in human history". So I clicked on my favorite science website, NASA's Astronomy Picture of the Day (APOD) to discover, of the millions of pictures that were taken that day, which one would be chosen for the APOD gallery. Here's the link to the APOD prize eclipse photo. Earlier, in preparation for this year's solar eclipse, APOD had previously published photos of former eclipses plus diagrams of the path of totality for the current eclipse. My favorite photo from APOD's eclipse science foreplay was a time-lapse eclipse movie, TAKEN FROM ABOVE THE EARTH by a Japanese satellite in geosynchronous orbit, showing the Moon's shadow passing across the surface of the globe. 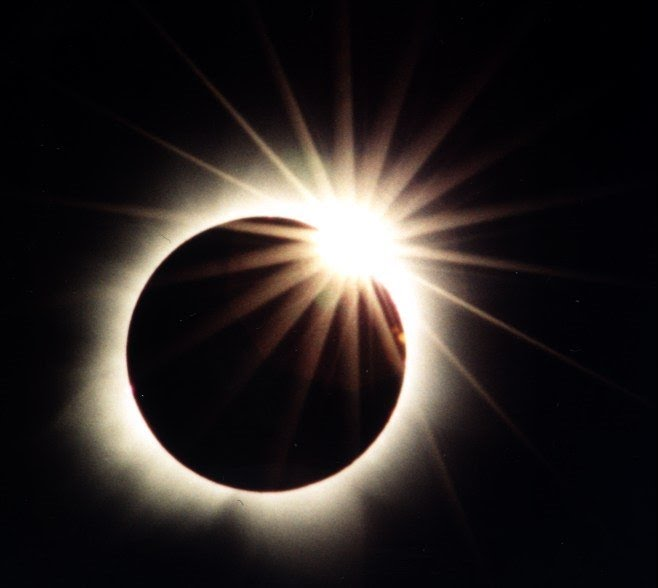 National Geographic magazine also got into the act by publishing on the web a series of 24 historic pictures from their files that featured various past eclipses, including the famous solar eclipse that made Albert Einstein a celebrity, during which Arthur Eddington was able to verify the deflection of starlight by the Sun that Einstein had predicted in his General Theory of Relativity. 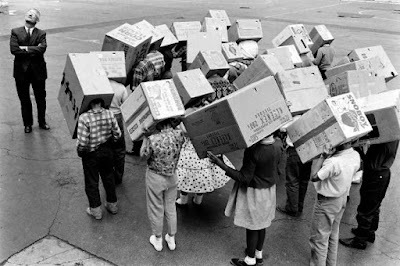 The picture of school kids wearing pin-hole boxes that heads this post was taken from that Nat Geo collection. But, among all the eclipse pictures, some taken by scientists, some by satellite and some by enthusiastic amateurs, my vote for favorite eclipse photo is for a snapshot made by a couple in Santa Rosa, CA, that used a household implement found in almost every kitchen. About ten years ago I decided that I needed another cat in my life. So I contacted my friend Lois whom I had met bottling wine at Ahlgren Vineyard who operated a cat rescue and adoption center on Two Bar Road, close to my home a few miles north of Boulder Creek. After lunch in her kitchen she showed me through her cat barn which contained about a dozen animals, some in cages and some running free. Most of the cats had been given to Lois to care for and to find homes, but one of them, a scraggy black tom cat, had just walked out of the woods on his own. He was a problem cat, attacking the other cats and of somewhat unpredictable behavior. Lois had named him "Onyx" and said that I would be doing her a favor by taking him off of her hands. I liked him immediately. So Onyx moved into my ashram and we began our little dance of domesticity and wildness. 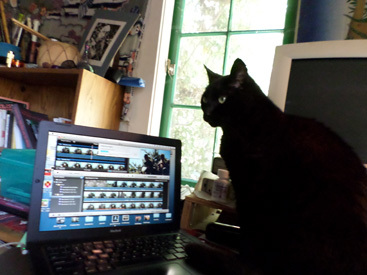 Onyx at the computer editing videos. 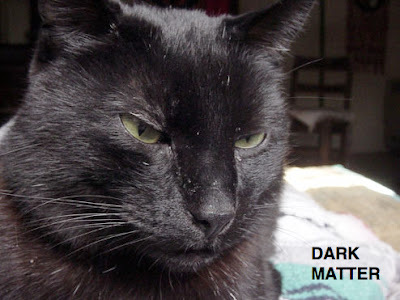 One of the most noticeable things about this cat was the sound he made -- like a squeaking door hinge. "MYRRKK!". Which drew comments like "When is your cat going to learn to meow?". Not too many people got to hear his squawk, because Onyx was mainly a one-man cat and would run into one of his hiding places whenever anyone new would visit. Usually I wouldn't see Onyx first, I'd hear him: "MYRRKK!" was how he'd announce his presence. And I'd turn my head towards that squeaky sound to see him crawling out of the bushes or hidden in my high-up sleeping loft. Nick and Onyx: it's obvious who's boss here. 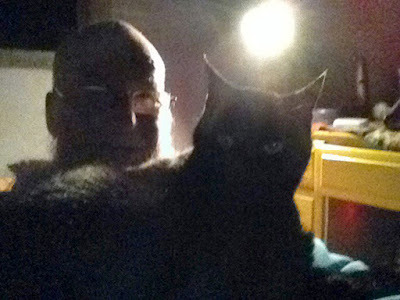 Onyx was mainly a nocturnal animal, kept the house mouse-free, and seemed to have a good nightly relationship with the raccoons and skunks that share space with us humans. Four-legged animals, I believe, have more in common with other four-legged animals than they do with the two-leggers. 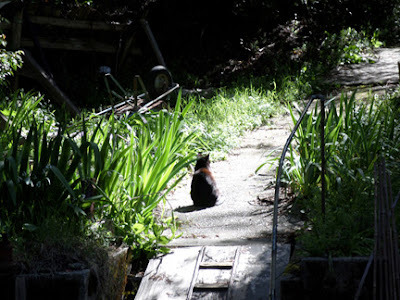 I remember hiking one afternoon in the creek bed of Arana Gulch in Santa Cruz and coming across a large dark four-legged creature "talking" to a smaller black-and-white four-legger in the grass. Upon becoming aware of my presence, the large animal ran across the creek, jumped onto the bank and disappeared into the forest. It was some sort of cougar or mountain lion. The small animal just sat there; I guessed it to be a large skunk. It was unafraid as I drew closer and turned out to be a big long-haired domestic cat, who casually turned her back on me and walked slowly back into the bushes. I had interrupted a tete a tete between two friendly felines gossiping about their very dissimilar lives. Onyx is famous! 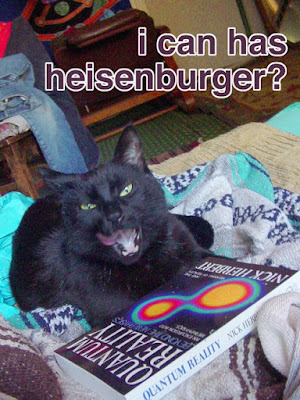 I made him into an LOL cat and sent his picture to the original I Can Has Cheezeburger funny-cat-meme site which is one of the main purposes of the Internet. Onyx mostly slept alone but often would sleep with me for a while before finding his own spot or going out hunting and socializing with the wildlife. When it was cold I could sometimes coax him to sleep under the covers. In the summer I like to sleep in my tree house and Onyx would sometimes climb up and share my space, looking at the stars with me and listening to the night noises. Wherever we slept, I knew that, near dawn I would hear hear his "MYRRKK!" and soon 15 pounds of cat would land on my chest, signaling "Time for breakfast!". 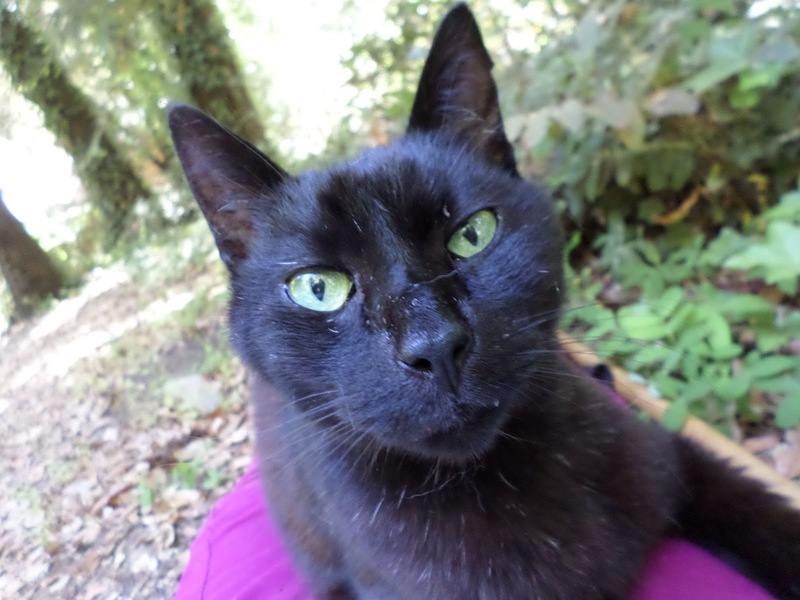 In recent weeks, Onyx has quit sleeping in the tree house, has been eating less and less, losing weight, spending more and more time alone in the woods, sometimes off for a day and a night. When he makes his sound and appears on the deck, he seems skinny but strong, affectionate and suffering no pain. He visits with me for a while, then hastens off on his own. Having kept lots of cats, I can recognize when one of them is saying "Good bye." Haven't seen him since. Love this well ere it perish.